The Funks stop for coffee. Math Pop Quiz: A rental car leaves Chicago headed east for Fairfield, Connecticut, 854 miles away. At approximately the same time, another rental car leaves West Lafayette, Indiana, 810 miles from Fairfield. The final vehicle, a rental truck, which when floored will top out at 72 MPH, leaves Charleston, South Carolina 823.5 miles away, also headed for Fairfield. Which will arrive first? The answer is the one that doesn’t stop. Or the one whose child has all their stuff packed and is standing at the curb with their stuff at the end of the academic year, waiting to go home. Jim Funk was headed to Chicago to rent a car and pick up his freshman daughter Annie from Loyola of Chicago. In the security line at the airport, he saw another Fairfield dad, Todd Chandler. Todd was going to get his son at Purdue in Indiana. Todd also spotted a woman from work. They were all flying out to pick up their children and drive their stuff back for the summer. Our family did not do it like that for the first few years of college with our daughter Caroline, who just graduated last weekend. I guess they are better parents. We had her share a storage space over the summer with a few other students in Charleston, and she flew home by herself with a light carryon bag. We did pick her up at the airport…we are not animals. This year she graduated and moved out of an off-campus apartment. We decided that a road trip to bring her stuff back was in order, but unlike the Funk family or the Chandler family, we would take our time. Three days on the open road. 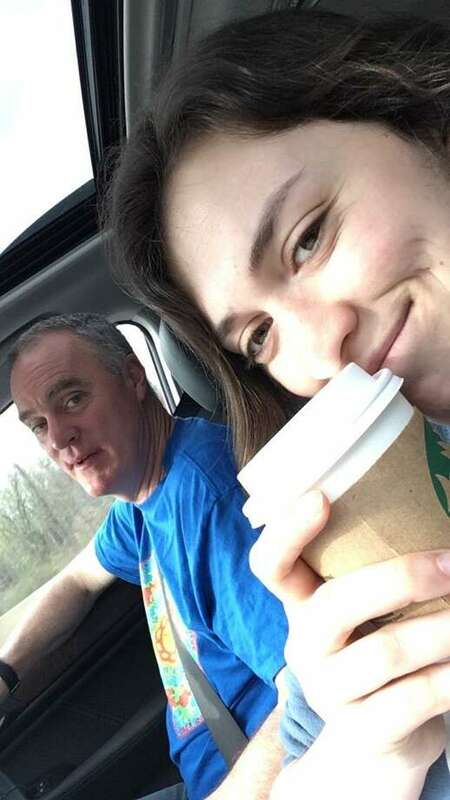 A father/daughter bonding road trip. We decided that we would visit relatives and stop at a few Civil War battlesites on the way north. We may not have another time where we have so much free time. I was much slower. The day after graduation, I picked up the rental truck and parked at the church parking lot near her apartment. Then proceeded to carry box by box, lamp by lamp to the truck. We forgot to get wheels. Why does she have so many lamps? The next morning, we got a slow start, 9:30 am. Actually we never left before 9:30 am on any of our days. We made it to Richmond the first day and saw my brother and his family. The next day, we only made it to Maryland 130 miles away, after visiting two battlefields. The third day we made it home after visiting relatives in New Jersey. I can’t speak for my daughter, but for me it was a memorable time. I was traveling with my daughter as two adults. We were just two just adults on the open road. Our conversations were great. We argued about religion, politics, relationships, and family. She hooked up her phone to the sound system and we argued about music selections. It was incredible. The Funks and Chandlers, as they sped across the northeast, also reported that they had a marvelous time. I was a very happy man as we pulled up to the house (before I realized we had to unload and shove all the crap into the garage with her sisters’ stuff also stored there for the summer, then return the truck that night). I might have gushed a little when I said that we should do another road trip. She said “ probably the next big road trip with just the two of us will be in a few years when I drive you to the nursing home.” How far away is the nursing home that they have picked out? After we got settled, I started thinking about the end of next year. Next year, I think I can beat both the other dads as my youngest goes to Fordham in the Bronx. Traffic on I-95 is bad, but I think I can do it.